T.S. Wilson Jnr Ltd boasts an impressive range of products spanning the full operation oftoday's modern industry. Machinery sourced from Japan, Europe and Australia, offers New Zealand printers the latest technology available and forms the backbone of the Company's success and reputation in the New Zealand marketplace. T.S. Wilson Jnr. 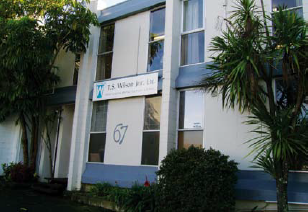 Ltd. is a third generation New Zealand business and is still wholely family owned. Now run by Stephen and Geoff Wilson, T.S. Wilsons supplies primarily Print Finishing equipment and Pressroom Supplies and maintains it’s hard earned reputation of only selling top quality equipment and supplies and servicing customers as professionally as possible. Steve’s background is in pre-press which has enabled him to develop skills beneficial to the company in offset and digital environments and has been the Managing Director for the past 15 years. Geoff is a qualified Print Finisher by trade, having served his time and many years as a tradesman operating folding machines, guillotines, collator stitches, perfect binders and more, in New Zealand, Great Britain and in Europe. With this as a basis, T.S. Wilsons Is more than capable of discussing all customers print finishing requirements in practical terms based on a true understanding of the processes involved. With showroom and warehousing facilities conveniently located in central Auckland less than a kilometre from North, South and Nor-Western motorway on/off-ramps, T.S. Wilsons continues to provide prompt service and easy access to Auckland customers, while undertaking regular visits throughout the country. The company was officially founded in 1954 by Tom Wilson Jnr. as he followed on servicing the printing industry as he had done with his Father, Tom Wilson Snr for many years previously in the original firm, TS Wilson Ltd. This was originally located at 186 Manchester Street in Christchurch. Historically TS Wilsons is proud to have been responsible for introducing many well known industry names, past and present, including; Komori, Dainippon Screen, Dold and Original Perfector.